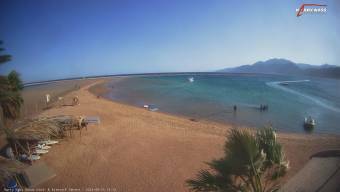 It's 13:17 in Dahab, Egypt right now. Kite Lagoon A livestream from the Kite Lagoon at the Surf Center Harry Nass. Dahab: Live from Dahab, 0 miles away. Sharm el-Sheikh: View of the Red Sea, 46.6 miles away. Costa Luminosa: View over the Bow, 76.1 miles away. Hurghada: Beach of Hurghada, 96 miles away. Soma Bay: Seaview, 118.5 miles away. Soma Bay: Soma Bay Beach, 118.5 miles away. Petra: The Treasury, 138.2 miles away. Petra: Visitor Center, 138.2 miles away.